My latest trail running adventure was one of the more interesting I have ever had. It took me from the peak of Bear Mountain to the banks of the Hudson, and left me exhausted, exhilarated, and at points hysterically laughing everywhere in between. I went, as usual, with my brother. On this warm Friday we decided that we would summit Bear Mountain for the first time, and then maybe tackle the Bear Mountain Bridge. Just a quick note- I keep referring to Bear Mountain as a mountain, which I understand is its official title, but I would like to be clear on this point: It is a formidable run, but at 1,284 feet is not much more than a rocky hill. Well, we did it. I actually had to walk part of it (where we lost the trail and were pushing through waist-high weeds), but we climbed it. At the top there was a tower (the Perkins Watchtower, I believe it is called), where our efforts were rewarded with a stunning view. We could actually see all the way to Manhattan (and it may have been my imagination, but I’m fairly certain I saw a visible smog hanging over the island), which was pretty cool. The way up was hard, especially the end where the trail got fairly steep, but it was nothing compared to the way down. We went down a different trail than we went up, and at first it was a relief to be going down. And then came the cliffs. Well, maybe not cliffs, but large, very steep rock faces which were not exactly runner-friendly. Naturally, we ran most of it anyway. And it was ridiculous. I don’t think I’ve ever experienced such a combination of fear, exhilaration, concentration, and pure joy before. When we made it down, I looked at my brother, smiled a broad grin through my sweaty face, and burst out laughing. 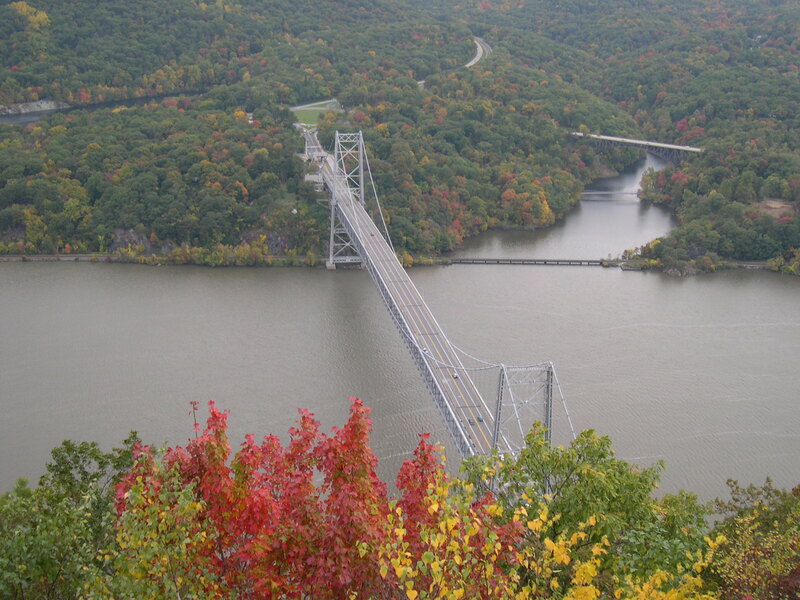 Now that we’d conquered Bear Mountain, we decided to head over to Bear Mountain Bridge. This we did, and upon crossing it we came on to a section of the Appalachian Trail. We started up, and though my brother could have continued, I was dead tired, and couldn’t handle the climb. So we headed back, and upon our return trip on Bear Mountain Bridge (which has a sign warning about aggressive falcons), my brother noticed a few more intriguing bridges crossing an inlet of the Hudson River. One was for trains, but the other two looked cross-able, so we decided to go for it. After a wrong turn into someone’s expansive backyard (who has their own foot-trail, for God’s sake? ), we made it over one bridge. We had really wanted to go over a curiously low bridge, so we tried to head down to it, and after getting directions and another wrong turn, made it. It was a foot-bridge that continued on a trail toward some fort and the Bear Mountain Zoo. And, we hoped, the car, because we were getting tired. I was, at least. After dipping our hands in the Hudson, we crossed the bridge and found ourselves in the lovely Bear Mountain Zoo. Little did we know how hard it would be to find our way out of the lovely Bear Mountain Zoo. We passed some falcons (or another large bird), owls, and a huge bald eagle on our first tour of the facility. And then we passed them again. And again. We were quite lost. Somehow, we found ourselves in the back of the zoo with a main street frustratingly just beyond our reach- there was always either a ravine or a fence in our way. Then we came onto a patch of open field surrounded by fence, with signs in the fence- facing away from us. As though we were an exhibit or something. That’s when it hit me: we might actually be in a zoo exhibit. I mentioned this to my brother, with the suggestion that we get on out. We did. As I looked back, I skimmed the signs which said something about a fort, so we may have only been trespassing on some historical remains, but it sure got my adrenaline pumping regardless. The tale has come to an end. We made it back to the car, drenched, exhausted, and talking about the most ridiculous run we’d ever been on. This entry was posted in My Runs and tagged Bear Mountain, Bear Mountain Bridge, Bear Mountain Zoo, trail running.